A veteran Ethiopian politician recently quit his opposition leadership post and called on others of his generation to step aside in favor of younger voices untainted by the country's legacy of Marxism. Yakob Hailemariam has experienced the best and worst in his 66 years. He is a former UN prosecutor in the Rwanda genocide trials. He was also a U.N. special envoy in the Cameroon/Nigeria border dispute. After a career as a law professor in the United States, he returned to his native Ethiopia and entered politics. He was elected to parliament in 2005, but never took his seat. Instead he was among 130 opposition leaders arrested in connection with post-election disputes and sentenced to life in prison. They spent 19 months behind bars before being pardoned. Sitting in his comfortable Addis Ababa apartment, Professor Yakob reflects on Ethiopia's troubled history since the 1970s, when the Marxist dictator Mengistu Hailemariam overthrew Emperor Haile Selassie. Mengistu was subsequently ousted in a bloodless 1991 coup by a Marxist-Leninist guerrilla group led by the current Prime Minister Meles Zenawi. Yakob says government policies still reflect Marxist-Leninist principles. "It's because of that tradition that the ruling party doesn't know how to settle conflicts peacefully," he said. "They run into throwing people in jail and some hard-handed measures that they take, and this has to go. And the Marxism-Leninism in this country is reflected in the national policy, too. If you look at the ownership of land, it is government owned. And many of the means of production, factories, they are still government owned. So there is a streak of Marxism still around." Ruling party spokesman Hailemariam Dessalegn rejects the notion of lingering Marxist-Leninist tendencies. In a telephone interview, he says the government's policies clearly reflect free-market and democratic principles. "We have clearly put that our policy is the market economy, a free market economy which is also applicable to developing countries, especially Ethiopia. So we are within the free market economy and multi-party democratic system," he explained. Professor Yakob recently resigned his leadership role in the opposition Unity for Democracy and Justice Party saying even he, like others of his generation, is tainted by his Marxist past. He laughs at himself when he uses the revolutionary term 'cadres' to refer to party members. He says the party's prospects for next May's parliamentary elections suffered a severe blow when its charismatic young leader Birtukan Mideksa was ordered back to prison for life for saying she had not asked for the pardon that freed opposition politicians jailed in connection with the 2005 dispute. "The biggest damage done to democratic movement in recent months is the imprisonment of Birtukan Mideksa. She is really an extraordinary young lady, she's young, and she's a woman, and this is exactly what we need in Ethiopia now with no streak of Marxism. And I think it is that realization that she was a tremendous force that she has been imprisoned," added Professor Yakob. Prime Minister Meles scoffed at the suggestion Birtukan's re-imprisonment was politically motivated. "I can't comment on this gentleman's Marxism. And what type of Marxism he was reading and what type of practice he had in his previous party, but if the case of Birtukan is the basis for his assessment, then his problem is not Marxism, his problem is dealing with facts," said Prime Minister Meles. "If he were prepared to deal with facts as they are, he would know that this lady was tried in a court of law. This has everything to do with elementary notions of rule of law, as opposed to any specific ideology, and his problem is he is not sure about this concept of the rule of law, rather than his concept of Marxism." 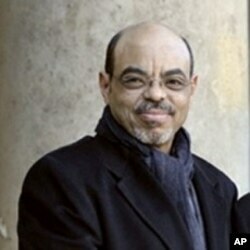 When asked if there is a possibility of a deal whereby the opposition leader might be freed, Mr. Meles was categorical. He said, "There will never be an agreement with anybody to release Birtukan. Ever. Full stop." Leaders of Ethiopia's main opposition coalition say they plan to make Birtukan's release an issue in the 2010 election campaign. But even the most optimistic acknowledge their chances of victory are very slim in a political arena dominated by Mr. Meles's ruling party.